Some of what former Trump campaign adviser Carter Page disclosed in testimony to the House Intelligence Committee last week matches up loosely with allegations made in the infamous Steele dossier, according to a transcript of his interview released on Monday. In particular, Page’s statements about a trip he made to Moscow in July 2016 included details that are laid out in the dirty document, which was financed by the Clinton campaign and DNC and authored by former British spy Christopher Steele. 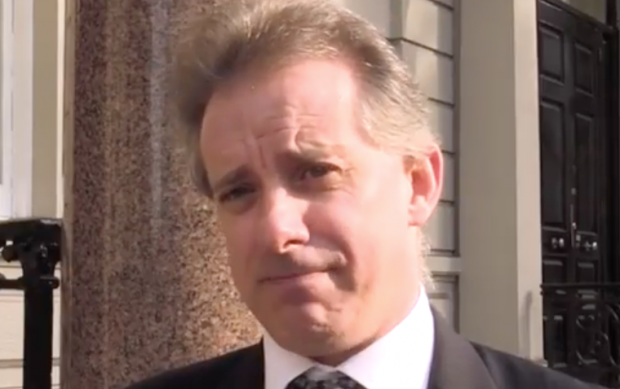 But Steele’s document did nail down something that Page revealed for the first time in his House testimony — that he met with an official with oil giant Rosneft during his trip to Moscow and that the topic of U.S. sanctions came up. Many analysts familiar with Russian tactics have said that they view the dossier as a mixture of truth and fiction. It could also be the case that Steele’s Russian sources and sub-sources (who he allegedly paid) planted disinformation that ended up in the dossier. In another scenario, Steele’s sources peddled unverified gossip that became distorted as it made its way back to the ex-spook. Steele makes five general allegations in the dossier about Page, an energy investor who joined the Trump campaign in March 2016. Citing unnamed sources, Steele accuses Page of colluding with Russians on the hacking of Democrats’ emails. He is also alleged to have met with two top Putin cronies to discuss removing U.S. sanctions against Russia in the event of a Trump victory. In his interview, Page denied the general allegations about him in the dossier. He vehemently denied meeting or knowing the people that the dossier accuses him of meeting and knowing, such as Trump campaign chairman Paul Manafort and Rosneft CEO Igor Sechin. But Page revealed some new details about his Moscow visit that resemble other allegations in Steele’s report. The first allegation against Page is made in a memo authored by Steele between between July 19, 2016 and July 26, 2016. Page strongly denied this accusation. He said that he has never met or talked to Manafort, who was indicted last week by Special Counsel Robert Mueller. Steele says that Page, who served as a low-level volunteer on the campaign, discussed the issue directly with an “ethnic Russian associate” of Trump, who was also a source for Steele. Page denied to House members that he knew anything about hacked emails. He said he did not hear about or discuss the hacking of emails with anyone until after it was reported in the news. While there is still no evidence to support the allegations made about Page in those two memos, parts of two other Steele reports ring true. Memos dated July 19 and Oct. 18 describe meetings that Page had during his Moscow trip. During those meetings, Page and his interlocutor allegedly discussed U.S. sanctions against Russian companies. And one of the individuals that Page admits he met with is an executive at Rosneft, the Russian oil giant. Steele’s dossier pegs Page as having met with Sechin, the Rosneft chief executive. The fact that Steele accurately reported that Page met in Moscow with someone from Rosneft strongly suggests that he received at least some information about the Trump adviser’s activities. The question that remains to be answered is whether Steele was given accurate information, inaccurate information, or a mixture of the two. In a July 19, 2016 memo, Steele reported that Page met secretly in Moscow with Rosneft CEO Igor Sechin, a close ally of Vladimir Putin’s. According to the dossier, an associate of Sechin’s said that the oil boss spoke with Page about removing U.S. sanctions against Russia in the event that Trump was elected president. “Page had reacted positively to this demarche by Sechin but had been generally non-committal in response,” wrote Steele. In an Oct. 18 memo, Steele provided new information he had received about Page’s alleged secret meeting with Sechin. He was informed by a close associate of Sechin’s that the oil tycoon “was so keen to lift personal and corporate western sanctions imposed on the company” that he offered Page and Trump a brokerage fee of a 19 percent stake in a deal involving Rosneft. Page has consistently denied meeting Sechin or of being offered a brokerage stake involving Rosneft. But he did reveal for the first time that during his Moscow trip, he met with a longtime friend, Andrey Baranov, the head of investor relations at Rosneft. Page said that he was in contact with Baranov prior to giving a commencement speech in Moscow and that the two met up at a function hosted by Morgan Stanley. During his testimony, Page suggested that Baranov may have brought up some of the topics mentioned in the dossier, including sanctions and the pending sale of Rosneft. “There was never any discussion of…my involvement in that deal in any way, shape or form,” Page added. After Schiff accused Page of giving an “evasive answer to a simple question,” Page acknowledged that Baranov may have made a “brief mention” of sanctions. But he said that the topics were hot-button issues in Russia and that discussing them would be akin to a U.S. Congressman discussing tax policy. Page vehemently denied another key allegation made about him in the dossier. In a July 19, 2016 memo, Steele alleged that Page met in secret on his Moscow trip with Ivan Diveykin, an official in the Kremlin’s political department. According to Steele, Diveykin discussed “a dossier of ‘kompromot’ the Kremlin possessed” on Clinton. He and Page also discussed releasing the information to the Trump campaign. Steele’s source also claimed that Diveykin may have hinted to Page that Russian leadership also had kompromot on Trump. Page reiterated to the committee what he has told reporters for months, that he had not heard of Diveykin until he heard about it from the dossier. Page said that he was contacted by a Wall Street Journal reporter on July 26, 2016, a week after Steele wrote the memo, about any contacts he had with Sechin and Diveykin. How much of the information Page has shared with Mueller, the special counsel, is unclear. The transcript of Page’s hearing is redacted in parts where Mueller seems to be discussed. The New York Times reported on Friday that Page has given testimony before Mueller’s grand jury.